Many soils in southern and western counties have lost frost down to 6-8 inches, while there is still a deeper layer of frost that will take more time to thaw out. The onset of spring-like weather has many Minnesota farmers thinking about field work. The U2U (Useful to Usable) Extension specialists in the Midwest have updated their quarterly newsletter with many tips for farmers to consider in planting and fertilizing this year's crop. An array of information and resources can be found at the U2U Web Site. More specifically a tool to assess corn planting and development can be found there as well. 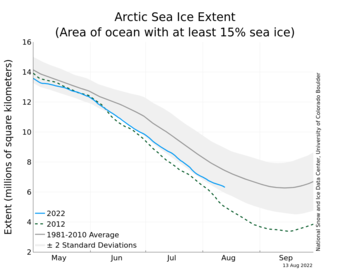 The National Snow and Ice Data Center recently showed the downward trend in Arctic Sea ice which has prevailed throughout the winter of 2014-2015. The overall extent of sea ice going into the month of March was at a record low, as shown in their graphic. NOAA scientists produced a recent discussion related to the question, "are record snowstorms proof that global warming isn't happening?" Their answer is emphatically NO! They offer a full explanation for this on their web site along with a variety of other climate perspectives via Climate.Govhttp://climate.gov/. Also available from NOAA this week is an interesting article written by Dr. Dennis Hartmann of the University of Washington Department of Atmospheric Sciences. He writes about the linkage between climate patterns in the Pacific Ocean sea surface temperatures (SSTs) and the recent weather patterns across North America, most notably the past two winters. One of his conclusions is...."while we are fairly sure that tropical SSTs are the apparent cause of the unusual nature of our past couple of winters, we do not know for sure whether this is just part of the natural variability of climate, or whether climate change is favoring the positive phase of the North Pacific Mode of SST variability." Four Tropical Cyclones were being tracked in the Pacific Ocean this week. The most powerful storm was named Pam was north of the islands of New Caledonia producing wind speeds up to 160 mph and sea wave heights of 45-50 feet. It was expected to bring damaging winds, high seas, and heavy rains to these islands this weekend before dissipating at sea north of Auckland, New Zealand early next week. A flood watch was in effect along the coastal regions of northeastern Queensland in Australia due to the presence of Tropical Storm Nathan. Thankfully it was expected to move east out to sea over the weekend. On the western coast of Australia, near Learmonth Tropical Storm Olwyn was bringing heavy rains and strong winds. It was expected to move towards Perth over the weekend. And a 4th weather system, Tropical Storm Bavi was in the North Pacific Ocean gaining strength and moving towards Guam. It was expected to remain modest in scale, but bring significant rains to Guam early next week. The EPA has released a new climate adaptation tool kit module called "Flood Resilience: A Basic Guide for Water and Wastewater Utilities." It is available online and may be of interest to a number of communities in Minnesota. The United Kingdom Meteorological Office announced this week a new forecasting service for the construction industries. This site specific weather information comes in two forms: located-based monthly planning averages; and location-based monthly downtime summaries. It is expected to be a popular service as the spring-time construction season gets underway. In Earth and Space Science News this week (EOS) is an excellent discussion about high latitude volcanic eruptions and their impact on climate anomalies. Their signal is clearly detectable. How often are the winds calm in Minnesota? When wind speed is less than 1 mph the observation is noted as "calm." In the absence of an anemometer, some observations of wind are recorded based on the Beaufort wind scale. On the Beaufort wind scale, when smoke is observed to rise vertically or the sea surface or lake surface is mirror-like, the wind is recorded as "calm." The frequency of calm conditions varies significantly around the state. For the Twin Cities the local climate records from the MSP airport show that a calm wind condition is reported only about 1.4 percent of the time, or about 123 hours per year. The month of highest frequency is July, when nearly 2.4 percent of the time a calm wind condition is reported. The month with the lowest frequency is January with 0.8 percent occurrence of calms. For the current month March, the frequency of calm is only about 1.2 percent of the time. In terms of the daily pattern of wind speed, calms are reported most frequently between 11 pm and 5 am, especially in the summer months of July and August. The average MSP high temperature for this date is 36 degrees F (plus or minus 11 degrees F standard deviation), while the average low is 21 degrees F (plus or minus 12 degrees F standard deviation). MSP weather records for this date include: highest daily maximum temperature of 67 degrees F in 2012; lowest daily maximum temperature of 12 degrees F in 1906, 1920, and 1932; lowest daily minimum temperature is -9 degrees F in 1895; highest daily minimum temperature of 46 F in 1995; record precipitation of 0.78 inches 2006; and record snowfall is 9.9 inches in 2006. Average dew point for March 13th is 22 degrees F, with a maximum of 54 degrees F in 1995 and a minimum of -11 degrees F in 1960. The state record high temperature for this date is 77 degrees F at Mankato (Blue Earth County) in 1990. The state record low temperature for this date is -36 degrees F at Campbell (Wilkin County) in 1896 and at Embarrass (St Louis County) in 2009. State record precipitation for this date is 1.85 inches at Winona (Winona County) in 1997; and the state record snowfall for this date is 18.0 inches at Duluth in 1917 and at Cloquet (Carlton County) in 1940. A significant winter storm visited the state over March 12-13, 1940 bringing rain, sleet, and snow. Schools were closed as were many highways. Air traffic and streetcar service were disrupted in the Twin Cities. Many observers reported over a foot of snow, while Collegeville, Windom, and Minnesota City received over 20 inches. March 12-13, 1990 brought an early taste of spring to Minnesota as afternoon temperatures soared into the 60s and 70s F. it was 61 °F as far north as Detroit Lakes, while in the south and west at least a dozen cities reported temperatures of 70 °F or higher. March 12-13, 2006 brought a mixture of rain, sleet, and snow to southeastern Minnesota. There was even some thunder as well. Observers in the southeastern cities reported total snowfall amounts ranging from 13 to 21 inches. Children were given a "snow day" off school on Monday, March 13th. March 13, 2009 may have been the coldest in state history. as 14 climate stations in the state reported morning minimum temperatures of -25 °F or colder. With two feet of snow on the ground the daytime temperature rose no higher than 9 °F at Red Lake Falls. A mostly sunny weekend with temperatures continuing to be 15-20 degrees F warmer than normal through Monday. Cooler by next Tuesday and Wednesday with temperatures falling back to near normal. Generally dry throughout the period.